Extreme rainfall hammered Boulder, CO with more than 17 inches of precipitation in just six days earlier this year. Salt Lake City’s snowpack—a critical water source—is showing troubling changes in its melting rates. Costly floods and overflowing storm drains plague South Florida’s coastal cities, such as Pinecrest. And storm surge and flooding from Hurricane Sandy caused millions of dollars of damage in Hoboken, N.J.
Take a look at these impacts and others, and it’s clear that these four U.S. cities—Boulder, CO.; Salt Lake City, UT; Pinecrest, FL. ; and Hoboken, NJ—are at the frontlines of climate change. But take a closer look and you’ll see that they’re also at the forefront of local climate action. 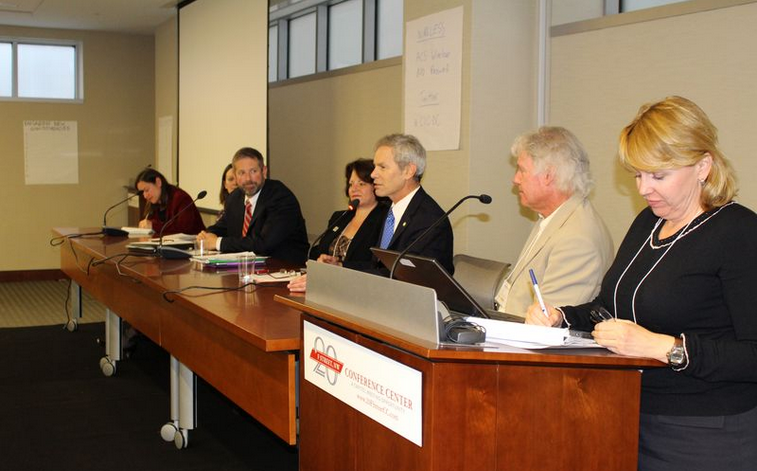 Mayor Matt Appelbaum (Boulder), Mayor Ralph Becker (Salt Lake City), Mayor Cindy Lerner (Pinecrest), and Assistant Business Administrator Stephen Marks (Hoboken) joined a panel discussion last week at an event hosted by WRI, the Union of Concerned Scientists, and the Meridian Institute. The local officials provided detailed accounts of how climate change is affecting their communities, as well as how their cities are adapting to impacts like sea level rise, flooding, drought, and wildfires. While each city’s experience is unique, their stories provide valuable lessons in how the United States can and must adapt to a warmer world. Boulder, CO. is already experiencing significant flooding and changes in seasonal snowpack melt, threatening the city’s annual water supply. “Our climate change issues revolve around too much water or too little water or water in the wrong places,” said Mayor Appelbaum. According to Mayor Appelbaum, Boulder is Colorado’s most likely city to flood. That vulnerability became a reality this September when an unprecedented deluge dumped more than half the city’s average annual rainfall in just two days . Experts believe that climate change played a role in the destructive rain. In a warmer world , an increase in heavy downpour events will likely become more frequent over numerous areas around the globe. Panel members, from left to right: Susan Ruffo, Deputy Associate Director for Climate Change Adaptation, White House Council on Environmental Quality; Carolyn Berndt, Principal Associate for Infrastructure and Sustainability, National League of Cities; Stephen Marks, Assistant Business Administrator, Hoboken, NJ; Mayor Cindy Lerner of Pinecrest, FL; Mayor Ralph Becker, Salt Lake City, UT; Mayor Matt Appelbaum, Boulder, CO; Christina DeConcini, Director of Legislative Affairs, WRI. So the city is taking action to adapt to the impacts it’s experiencing today, as well as preparing for those it may experience tomorrow. Boulder established “high hazard” zones in flood-prone areas, as well as strict building codes that prohibit any new development in those zones. It’s created a network of bike lanes and underpasses that serve as flood control structures. And it established a joint emergency operation center with the county—the only one of its kind in Colorado. The city is investing in watershed protection and diversifying its water sources in order to safeguard its water supply in the face of earlier snowmelt. It’s also focusing on data collection and analysis, examining new climate models and regularly remapping its floodplains. Boulder isn’t alone in experiencing climate impacts—or in building its resiliency. Salt Lake City—already one of the United States’ most arid cities—is seeing troubling changes in its snowpack as well. In South Florida , Pinecrest’s communities are concerned about sea level rise, storm surge, and more frequent flooding—as well as these impacts’ effects on critical city infrastructure like sewer systems. And after witnessing Hurricane Sandy cause widespread power outages and record water levels throughout New Jersey, Hoboken’s officials fear for the 80 percent of the city that’s designated as a flood area. These cities are turning their concerns into tangible action. According to Mayor Becker, Salt Lake City is investing in net-zero facilities and LEED standards for buildings. The city recently received the 2013 Mayors’ Climate Protection Award from the U.S. Conference of Mayors. Pinecrest is part of the Southeast Florida Regional Climate Compact, a four-county, bipartisan agreement to engage in mitigation and adaptation activities that address local climate impacts. And in the wake of Hurricane Sandy, Hoboken has developed a nine-point resiliency plan, involving actions like building a micro-grid, constructing armored levees and sea walls, and installing green infrastructure to hold seawater. But while leaders at last week’s event were enthusiastic about their own cities’ efforts, all of them agreed that there’s still much work to be done. One of the biggest challenges, they said, is getting state and federal leaders to take action of their own that supports the work going on at the local level. “There’s such a disconnect between the reality of what we’re working with in our communities and how people are addressing things here [in Washington],” said Mayor Becker. To that end, a couple of new initiatives aim to use the work of innovative cities to inspire greater national climate action. The National League of Cities’ Resilient Communities for America campaign works to get U.S. mayors and local leadership to commit to solving environmental, energy, and economic challenges. Organizers hope to secure 1,000 signatories to the campaign by 2015.